Well, more than a week has passed since I visited the show, and I'm still trying to process the experience. It was so big, and so much. Plus, I got in on a media pass (my first time, courtesy of this blog!) and thus I feel responsible to deliver a masterwork of reporting. But in the end, I think I have this to say: It was inspiring and it was overwhelming. I would like to go again. It was not terribly relevant to my gardening, as I lack the resources to implement any of the ambitious ideas put forward in the display designs, but it was a lot of fun. It was like the Sundance film festival must be to a kid who's shooting movies in his backyard with an old digital camera. Nice to see what others are doing; a little daunting. So I am turning my attention back to my own, current reality. 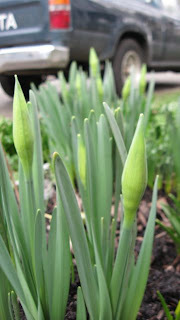 Spring is fast approaching in Seattle, the winter-bloomers have been active for some time (Hellebores, Witch Hazels, etc. 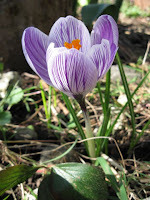 ), and swarms of Crocus are erupting out of the ground. The Forsythia in my front yard is on the verge of bursting with a thousand suns and the daffodils are standing at the ready. At my house, we have planted several bare-root fruit trees, including a plum, a persimmon, and a peach (courtesy of City People's). We have built a fence to keep the chickens out of one half of the backyard, as they were turning the whole yard into a chicken-scratched wasteland. We now let them out regularly and have found that they put themselves back in their coop at dusk, so we need only close it up nightly before the raccoons come prowling. At our P-Patch, my housemate planted peas, mesclun, and spinach, then it snowed. Hopefully the seeds hadn't sprouted yet. I dragged home a discarded window from a nearby curb and have put together an impromptu cloche for starting lettuce and peas at work. That, hopefully, is today's project. The sun has arrived. Oddly, that is not unusual these days. They don't make winters like they used to.